In addition to spending time in Brussels with Jack and Annie, we were fortunate not only to have the opportunity to meet with two old friends but also to meet two new friends, all members of TheTravelzine, our discussion group. Paolo from Trieste, Italy, has been a member for some time and we have always enjoyed his unique blend of wisdom and wit. We were so fortunate when he agreed to be one of our moderators and totally overjoyed when he wrote that he and his young daughter, Livia, would come to Paris for holiday shopping, a visit to Euro Disney and to meet us! We spent the better part of the morning in Le Marais, getting acquainted and popping in and out of shops. We wanted to find a lunch spot that was not Italian but would appeal to Livia, who had been raised for her eight years on an Italian diet. Well, how about Polish/Russian! Le Ravaillac, 10 rue du Roi de Sicile, 75004, 01-42-72-85-85, offered veal Viennese, which is their version of a breaded veal cutlet, which Paolo thought Livia would enjoy. She sure did - along with the home fries; we had picked a winner. The food is authentic home cooking in a comfortable, Eastern European atmosphere. Thick cabbage soup, cheese pierogies, grilled sausage with sauerkraut, smoked trout - all wonderful and from a caring kitchen at very reasonable prices. After a stop at Finkelstajn to secure a piece of cheese cake for Paolo to take home, we headed west on rue de Rivoli to the Shops of the Louvre, for Paolo to do some last minute shopping before heading up to Charles de Gaulle. We haven't been to Trieste for many years and now we have a special reason to return. 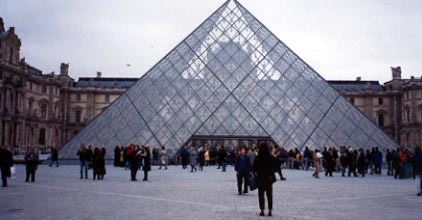 The vast courtyard of the Louvre, formed by the united palaces, is an awesome sight particularly when you view the dichotomy created by the 71 ft. high glass pyramid and centuries old architecture. It was a clear, bright day and looking through the pyramid to the palace gave us the unique perspective that the architect had intended with his brilliant, controversial design. The gorgeous Arc de Triomphe du Carrousel leads into the Jardin des Tuileries, a continuum of open space on the bank of the Seine in the center of the city. The 67-acre Tuileries park could hardly be better placed with the Louvre to the east, the Musée d'Orsay across the Seine to the south and the Jeu de Paume and the Orangerie galleries looking over the Place de la Concorde to the west. Soon old friend, Simona, from Torino, Italy, would be in town and the week-end before heading home our dear, old friend Fabio from Locarno, Switzerland, would come to Paris and we would meet another Ziner for the first time, Covadonga from Bilbao, Spain. Covadonga had suggested that we meet her the evening she arrived at a Greek restaurant in the 6th. After a visit to Notre Dame, it's impossible not to walk around the outside and gawk at the artistry of the stone work. We crossed over to the left bank to Orestias, 4 rue Grégoire de Tours, to make a reservation for Cova's visit. It was early, 18:30, but we were hungry and are suckers for Greek food and they were open and happy to have us. This establishment is supposed to be one of the oldest Greek restaurants in Paris. It sure looks and acts it! It's like being in the only taverna in a small Greek village. Stuffed moose, wild boar and deer heads stare down at you. Tacky, Greek paintings adorn the walls and the antics of the staff were a hilarious side show. To say nothing of the cat who felt right at home under - and on top of - a table. Oh yes, let's not forget the huge crystal chandelier and the rattan ceiling fan. While we eating our Greek salad and huge portion of delicious roast lamb, the staff of six men and a woman were having their dinner. There was a huge pot of spaghetti, another of sauce, a bowl of grated cheese and a platter, piled high with boiled, pinkish hot dogs. Some ate the spaghetti out of the pot, others filled plates, adding sauce and tons of cheese and they all sat facing us slurping and sucking the pasta with sauce and cheese flying in all directions. The pink creatures were eaten by hand between mouthfuls of pasta. The occasional burp lightened the eating frenzy. After the feast was over, a few of the boys settled in for a game of cards. The loser got so mad, he slammed his cards down on the table so hard they flew all over the places as he rose to his feet knocking over his chair and ran upstairs hurling curses at the men below. The food is good, the price is right and if you want some entertainment with your meal, show up early! We were in touch with Cova by e-mail and told her we had eaten at Orestias and she was quick to select another spot, which turned out to be our favorite - but more about that later. We walked through the 11th arrondissement to meet Jami's tenant, Jeff, and to see the apartment. Rue Chemin Vert is a street filled with wholesale fashion outlets. It was busy up and down the street with buyers loading goods into their trucks and cars. Taking rue St. Maur north, we passed a lovely street, rue La Charriere, with a historic, pretty park and gracious apartment buildings both old and modern in design surrounding it. It was a charming neighborhood. Jeff was waiting for us at the apartment, which is terrific, and joined us for lunch at 108, just up the street at 108 Oberkampf, 75011. This was another of Jami's faves and for good reason. It's a tiny place with limited seating and simple atmosphere - but wonderful cooking at great prices. Each of us had a two-course lunch menu at 72FF. Linda and I had a luscious pureed vegetable soup to start and Jeff a mushroom, artichoke, potato omelet. As mains, Linda had a lovely steamed vegetable plate and the guys had filet rouget - three large filets, beautifully grilled, served on a bed of spinach and an excellent rice with a light lemon, cream sauce. Incredible value! And the sweet waitress was lovely. After lunch, we continued east and then north on Boul. Belleville to the Belleville area, which is home to a sizeable Asian community with numerous Chinese and Vietnamese restaurants and a kosher butcher shop! Guess this neighborhood has been home to working class immigrants for some time. Walking south from Boul. de Belleville to Boul. de Menilmotant, we saw the green men cleaning-up the remains of the street market that had taken place in the center island of the boulevards. It's all here: Asian, African, Arabic, Jewish, Greek, East Indian - food and fashion of all these cultures. Continuing south, we came to Place de la Nations, a large square with a splendid, circular park in the center. Walking west on rue du Faubourg St. Antoine, we found a lovely neighborhood of wonderful residences, courtyards and passageways, whose residents would never go hungry. Marvelous food shops and restaurants were everywhere as were shops for every household need. Rue du Faubourg St. Antoine leads to Place de la Bastille, which was jammed with folks dashing in all directions in the early evening hour. Finding your way around this square can be confusing, especially in the dark, as it is the junction of so many streets. It was amusing to observe so many people, many with map in hand, trying to find their way and finding no knowledgeable help. It wasn't that people didn't try to help when asked but rather that they were as confused as the ones asking for directions. We were old hands by now and proceeded on our way to one of Jack's recommended restaurants, Le Petit Picard, 42, rue Ste.-Croix de la Brettonerie, 75004, 01-42-78-54-03. This casual Marais restaurant, with pretty stone walls and cut-out ceiling painted sky blue, offers impressive value. There are three-course menus at 64FF, 89FF and 129FF and the a la carte choices also are very fairly priced. Here again, it was a full house with what we judged to be mainly locals. Linda had an 89FF menu, starting with a fabulous, thick gazpacho and a main course of a roasted rabbit leg quarter in a grainy mustard cream sauce. My crisp salad with warm goat cheese and rack of lamb was from the 129FF menu. Both mains came with hot and spicy gratinated potatoes and fresh cooked, sliced carrots. You know who had the hot fudge sundae and who had the sherbet. Everything was wonderful and with a half bottle of red Medoc from Bordeaux, it was extremely reasonable at 282FF. Jack certainly does know good value. At this point, I must tell you about Restaurant Astier, 44, rue J.P. Timbaud, 75011, 01-43-57-16-35, 01-43-38-25-56, as it is located not far from Jami's apartment, we stopped in to make reservations when we went to see her apartment. It's a small, unpretentious place with the tables packed-in for maximum seating. Don't let that deter you because the one price (145FF) four-course menu offers a long list of traditional French courses. Linda had a classic preparation of escargot and to balance her garlic I had herring filets with onions. If you like herring, as I do, this is the way to have it. I was presented with a very large pot filled with tender filets and slices of sweet onion for me to eat as many as I wished. A bowl of boiled potatoes accompanied the herring. These appetizers with large chunks of crusty, chewy bread were enough for a delicious meal. Just three courses to go. It was Linda's turn to have roasted lamb with beans while I stayed with fish and had cod wrapped in a pastry shell with a spinach mousse in butter sauce. Both were generous portions, beautifully prepared. After a welcome wait, our happy waiter arrived carrying an enormous tray of cheeses which he squeezed on the table between us and the two women sitting beside us. We rarely allow ourselves to indulge in cheese as a course unto itself, but the fresh and beautiful selection demanded attention. The women graciously explained the attributes of each variety and helped us to select a few slices we could try. The dessert list was impressive and it was difficult to choose. Help was sought again and provided; the women recommended the clafouti Mirabel, a delicate quiche which Linda loved. My nougat ice cream (three large, creamy scoops) with a marvelous praline sauce was heaven. With a half bottle of Touraine Espage Gamay, this exceptional meal for two was 355FF. Now you would have expected that our two dining neighbors would have given us a few clues for our treasure hunt, but alas, they were more interested in where we had dined. Many people have misconceptions about Paris. What may have been a problem in the past is just not true today. The Parisians are friendly, helpful and interested in what goes on beyond their borders. Not being able to speak French is no longer a barrier. It's appreciated if you use the common French greetings but there's lots of English spoken and there's always someone to help with the signs. Portions of food are not small and all food does not have rich sauces. It was time for a visit to the 5th and 6th arrondissements. 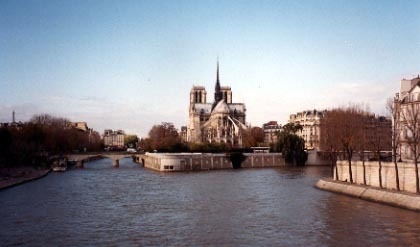 We crossed from the 4th to the 5th at Pont Marie and Pont de la Tournelle, from which the Seine views of Notre Dame are spectacular. Having never been to the popular market street, rue Mouffetard, we headed directly there. It's old, timeworn and the reason we love Europe. It's a part of the old world that doesn't exist in the new world; low buildings, huddled on a narrow street, with small shops, and enticing eating choices, blended together into a single, diverse whole: pizza, fondue, running shoes, Greek, Asian, books, fabulous pastry at #111, cheese, chocolate, Russian, bread, Argentinean and the list goes on. It was the tail end of the street market at the north end and already the green men and the machines were moving in. Heading west on Boul. de Port Royal and Boul. du Montparnasse, we were struck by the magnificent apartment buildings lining these wide boulevards and the wonderful restaurants, clubs and cafes, many of which were frequented by famous writers and artists in the city's rich cultural past. We walked along the lovely Boul. Raspail, with its center island of trees, to rue de Rennes, the complete opposite of rue Mouffetard. Here we have the finest designer shops, gourmet foods, exclusive boutiques and services and the clientele to match. Gotta love it! Simona, our friend from Torino, arrived at our hotel on schedule and shortly afterward her friend Michele, with whom she was staying, arrived too. Michele explained that Olivier would join us later. It was wonderful to see Simona again. It had been quite a while since our last get-together in Athens. We headed out for dinner to another of Jack's recommendations, Le Coude Fou, 12 rue de Bourg-Tibourg, 75004, 01-42-77-15-16. The menu and environment, from the long, wooden bar to the dark green walls painted over with people scenes, is southwestern France. As a neighborhood favorite, this place is always packed. It was perfect for this evening as we sat for many hours catching-up on the news, getting acquainted with Michele and, of course, eating. Linda and Simona started with fresh mussels soup with cream, saffron, white wine, leeks and carrots. Unfortunately, the dish arrived with a burned flavor; it was promptly removed and replaced. It was delicious but disappointing that the burned version had ever been served. Michele enjoyed her hot goat cheese and grilled edam with green salad and my pan-fried calamari in tomato-seafood sauce was delicate and delightful. Linda and I had marvelous breast of baby duck, served with ratatouille and potato puffs. Michele enjoyed a duck leg quarter in wine sauce, served with gratinated sliced potatoes. Simona was disappointed that her fish filet came smothered in a cream sauce and we agreed that was not the way fresh fish deserved to be treated. The various desserts were very good: crème brûlée, ice cream, fondant au chocolate. We all enjoyed a Beaujolais Nouveau 2000. We met Simona and Michele the next morning at the Place Pigalle metro for a tour through Montmartre and the famous flea market Le Marché aux Puces de Saint-Ouen at Porte de Clignancourt. I would have explored Place Pigalle but being with three determined women who wanted me all to themselves, we headed north up rue Houdon, through rue Abbesses to rue Ravignan. The buildings and homes were old and basic in style. There's a gorgeous old stone house at #19 rue Ravignan, which unfortunately had zillions of pigeons on its roof. Place du Tertre is the quaint old town square with its perimeter occupied by terraced restaurants, cafes and art galleries. It is not easy to escape the hordes of portrait painters offering their services. The appeal of the village is diminished by the commercialism of the portrait hawkers and T-shirt and postcard sellers. 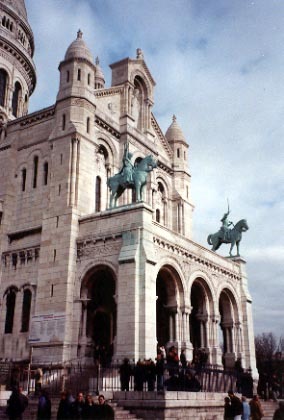 The Sacre-Coeur church is beautiful in the simplicity of its stone work. Its site, on high overlooking the city, is spectacular - on a clear day, a photographer's dream. 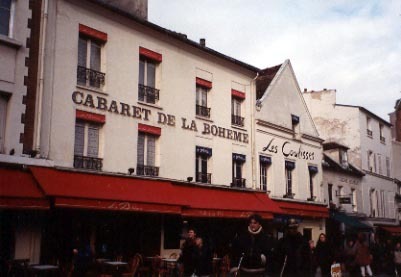 At 11 rue Poulbot (Place du Tertre) 75018, is the Espace Dali. Dali produced so much incredible art in so many forms it is mind-boggling. This small museum presents hundreds of his works in a comprehensive format with excellent explanations of each of the styles and individual pieces. There is a fine selection of signed lithographs for sale, priced 3600-45000FF. With Michele leading the way, we continued hiking north. We noticed that rue Marcadet and rue Ordener appeared to be very nice middle class residential streets. Michele told us this area is quite popular now because the rents are still quite reasonable. We were ready for lunch and settled on one of the gazillion Chinese/Vietnamese fast food eateries that are everywhere. Yuan Long is at 54 rue du Poteau, 75018. As at all the others, the foods are beautifully displayed in cases and heated to order in microwave ovens. For a quick mediocre meal it is fine - just don't make it a habit; there's too much really good food to enjoy. You know when you've arrived at Porte de Clignancourt, billed as the largest flea market in the world. Hordes of shoppers sweep you northward to a seemingly never-ending complex of open stalls and shops. There isn't a race, religion or culture not represented here, either as vendor or buyer. Watch the action and enjoy the experience. It's frantic and we could take just so much and settled onto a neat, small street lined with antique shops, a few restaurants and cafes. After a coffee break, we got on bus #85 back to the city just as the rain and dusk began to fall. Simona expressed an interest in Moroccan food and we immediately started to call three that we had on our list other than 404. It was Saturday and we knew it would be difficult. The first two were booked but luckily L'Atlas, 12 rue St. Germain (at the corner of Cardinal Lemoine), 75005, 01-44-07-23-66, had room for us. L'Atlas is the antithesis of 404. Where 404 is casual, L'Atlas is formal. The 404 staff dresses in tight pants and printed T-shirts whereas at L'Atlas we were greeted by a gowned hostess and the waiters wore formal attire. We felt like we were entering a Moroccan palace. Instead of packed seating, the dining room is designed in sections for maximum comfort with fine table linens, china and cutlery and service to match. Although the patrons were more mature here, most were dressed just as casually as at 404. The environmental experience is totally different but the food is just as good. We were not rushed and lingered quite late enjoying our visit with Simona. Linda and I started with Moroccan salad (chopped tomato, peppers, parsley) and smoked, peppered trout served with greens, peppers, onion, carrot, green beans and orange slices. Simona was the smart one because the portions of couscous and tajine were a challenge. The girls had couscous, Linda vegetable and Simona lamb. The waiter brought large pots of couscous, a tureen of piping hot cooked vegetables in a delicious broth and chunks of roasted lamb in a light, natural gravy. The girls were on their way to heaven. There were side dishes of raisins, chickpeas and hot sauce to add as desired. My tajine of tender lamb, prunes and whole almonds was a dream. The girls thought the Beaujolais Nouveau Chateau de Pizay was better than the one we had the night before - and women are always right. We finished with traditional mint tea. The prices are about the same as at 404 and this splendid experience was quite reasonable at 643FF for three. When in Paris, eat Moroccan!